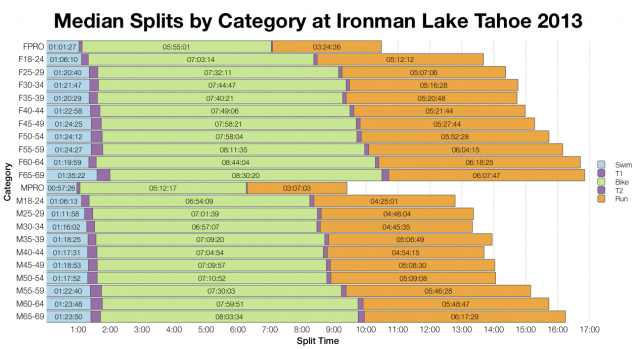 There are two US Ironman races taking place this weekend: Maryland and Lake Tahoe. The first is a new event – I’ll look at the results from that next week – but Ironman Lake Tahoe is entering it’s second year so I can review the 2013 results. Year one at Lake Tahoe established a reputation as one of the toughest Ironman races on the calendar with a DNF rate of roughly 25% and the slowest average finish time of 2013. A tough course and cold conditions were a major challenge on the day, this year’s weather will also play a big role in how Sunday’s race pans out. 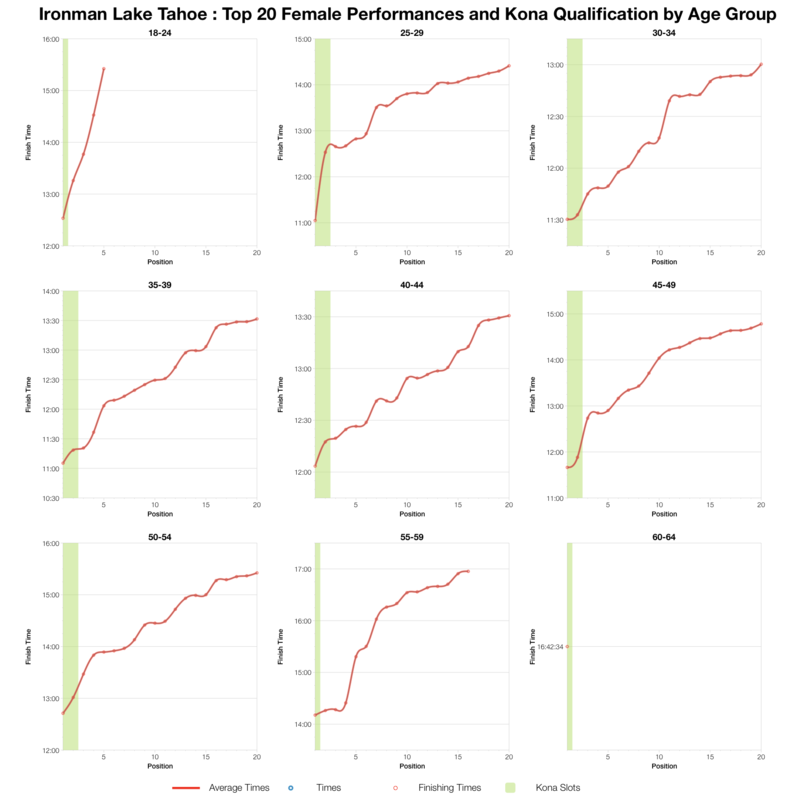 Comparing the median splits by age group for Lake Tahoe and the rest of the US Ironman races last year and immediately we can note the – generally – slower finish times. 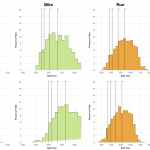 The biggest difference comes on the bike, swim and run aren’t consistently or significantly divergent from the aggregated US results. Altitude, climbing and very cold conditions to start the bike can easily explain this shift. 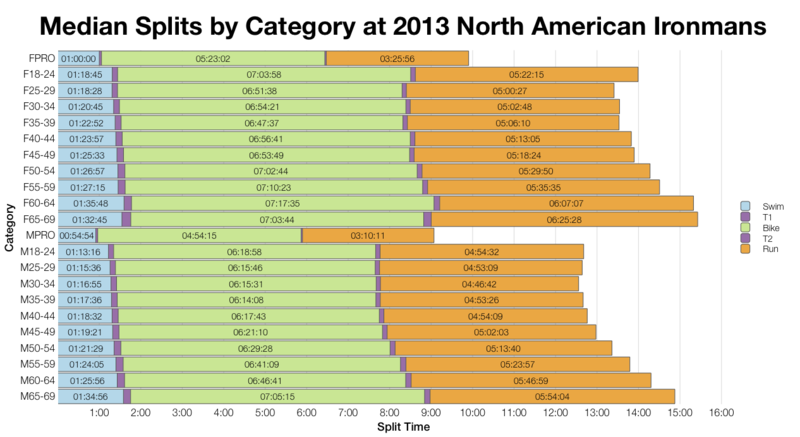 For further clarity we can also compare the distribution of splits amongst finishers. 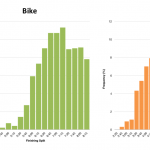 Here you see the huge shift in bike times, roughly 45 minutes slower than we might expect. It’s also worth noting that the high DNF rate and the impact of cut off times likely help to skew the run splits by cutting out weight towards the back of the curve. Overall though it’s the major shift in bike times that leads to the major shift in overall finish times. The above table contains my estimates for Kona slot allocations at this year’s race. Figures are based on the bib list available on Ironman.com, the final allocation will depend on start numbers. Interestingly there is a large drop in entrants for this year’s race with 2,650 on last year’s bib list and only 1,633 age groupers this time round. As I always stress it’s hard to make any form of prediction from one year of racing. 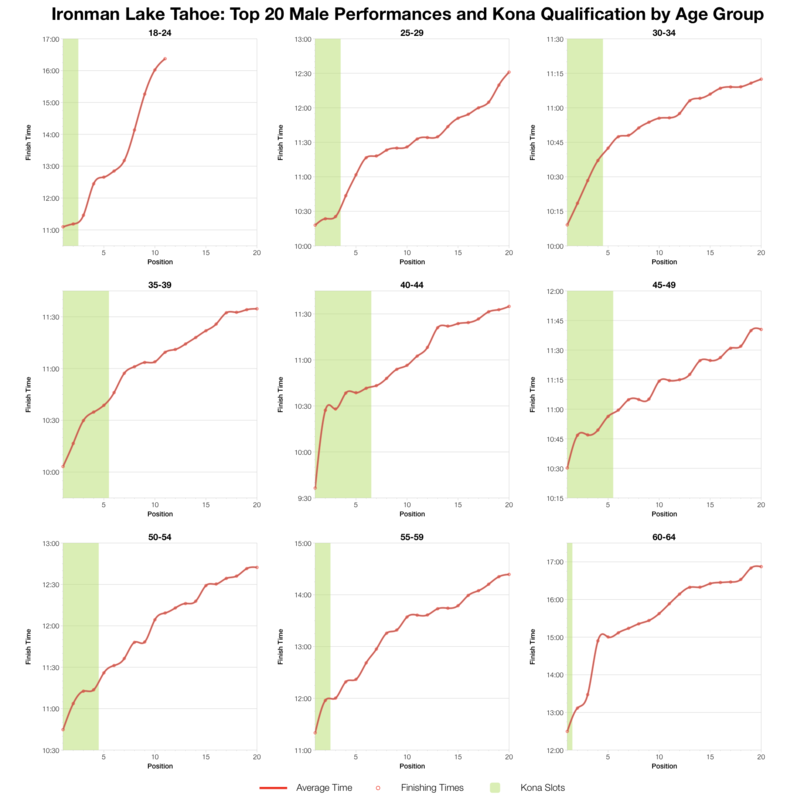 What we can take from the top 20 charts is that qualifying times are slower (as we’d expect from a slower course) and that there’s a big drop off in times from age group winners to those in tenth and twentieth placings. I’d be reluctant to note anything more on the performances at the front of the race. 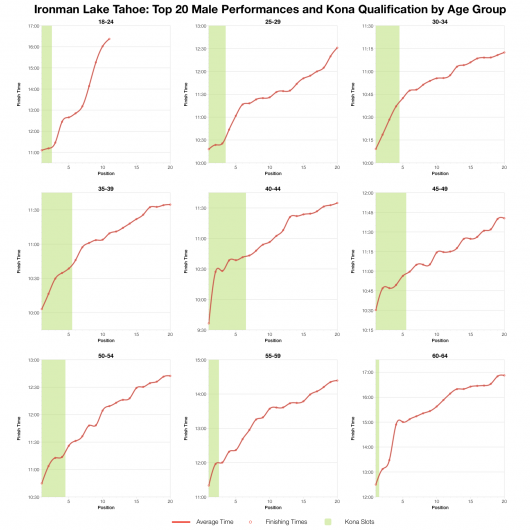 One year of racing suggests we can expect a tougher, slower race in Lake Tahoe. Whether this year will match the last is another question – I certainly don’t expect fast times from this course, but if the weather is a little more favourable we might not see the same levels of DNF. They’ll be a full analysis as usual early next week.